Adding a beautiful dash of greenery in the heart of Chattanooga’s Southside, the Glenn Miller Gardens attract locals and tourists alike to the Chattanooga Choo-Choo Historic Hotel property. Recently, the gardens got an updated look to welcome even more guests and transport them to the olden days, when locomotives stopped at track 29! To expand the usable space in the gardens, some hedges were removed, immediately expanding the feel of the space and creating an even more inviting and open atmosphere. The fish pond got a makeover, and new flowers were added. 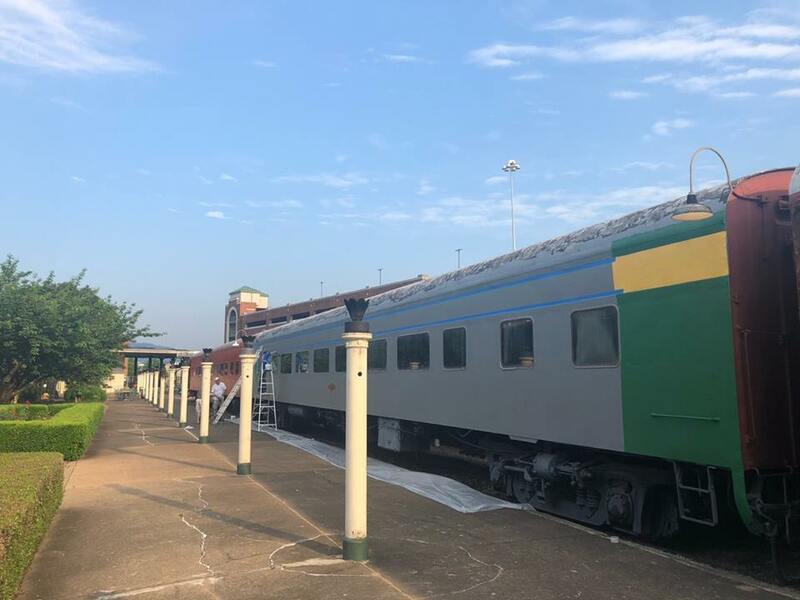 The general space got lawn games and rocking chairs, and several of the train cars are being repainted to their original bright colors from the 1930s and 1940s. Choo-Choo President Adam Kinsey hopes to bring more events to the space, and a refreshing of the historic gardens was a great way to increase foot traffic to the area. BrewSkies beer and food festival relocated to the Choo-Choo gardens this year, as did the upcoming Tennessee Whiskey Festival. In the winter, the region’s only ice skating rink turns the property into a winter wonderland. Check out all of the events happening at our downtown Chattanooga hotel. Shopping options are right next to the gardens and include Sweetly Southern, the city’s oldest gift shop, and Refinery423 Mercantile, which is located in a train car and offers a curated collection of goods and gifts for men. Additional shops will be announced soon. American Draft is also located in a train car and is open to guests and locals alike. The bar offers 29 beers on draft, and you can pour your open drinks, from a sip to pint! The Glenn Miller Gardens is not the only part of the property being renovated. A new entryway from the Grand Dome was created as convenient access for people to migrate from Frothy Monkey to the gardens. On the north side of the property, far away enough not to disturb any guests or visitors, construction staff are working to uncover and showcase the original 1906 concrete floor and terrazzo tile floor. A new restaurant is under construction where the former Victorian Lounge and Roosevelt banquet areas were previously, and the team is working to preserve architecture details from the original banquet halls. Also, the original ceiling from 1906 was discovered during the clearing, adding to the throwback aesthetic. In spite of all these updates, the hotel and other businesses are still running as usual, as these areas are not adjacent to rooms or hotel cars where guests are staying. For more on the attractions and entertainment in the Choo-Choo property, check out the Chattanooga Choo Choo Hotel blog! Interested in having a fundraiser, community-wide event or private wedding in the gardens? Contact us!